Our goal is for our residents’ remaining years to feel extremely special. 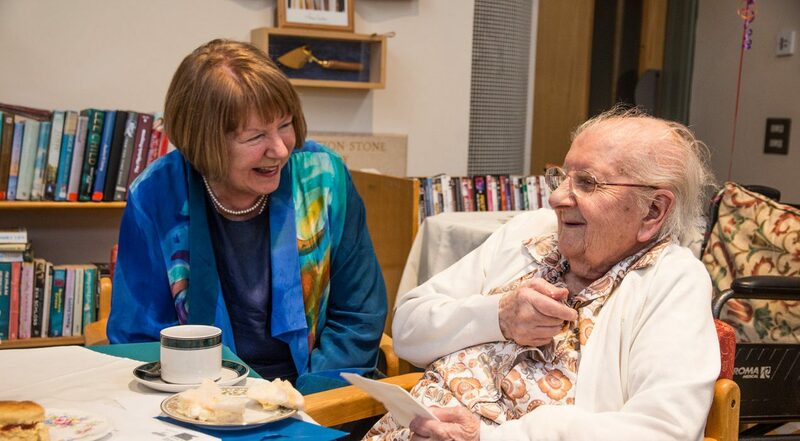 So Bridgemead provides a homely environment, where residents take pleasure in familiar comforts and belongings – enjoying their independence while knowing they are always well looked after. They can choose whether to spend time and take meals in the privacy of their rooms, or whether to mingle with friends in the convivial communal areas. Communal dining room: At the heart of the home for a wide range of activities and entertainment each afternoon. There is also a lovely south-facing conservatory. Family rooms: The sense of family is enhanced by four family rooms located centrally on each floor. They are ideal places to meet, relax and entertain. Gardens: Residents and visitors can enjoy the tranquillity of our rooftop and riverside gardens. Other services and activities: We provide a shop trolley, library service and regular refreshments. Hair styling, chiropody and newspaper delivery is also available. We also provide exciting outings for those who wish to take part. Recent trips include visits to National Trust properties and a local farm.